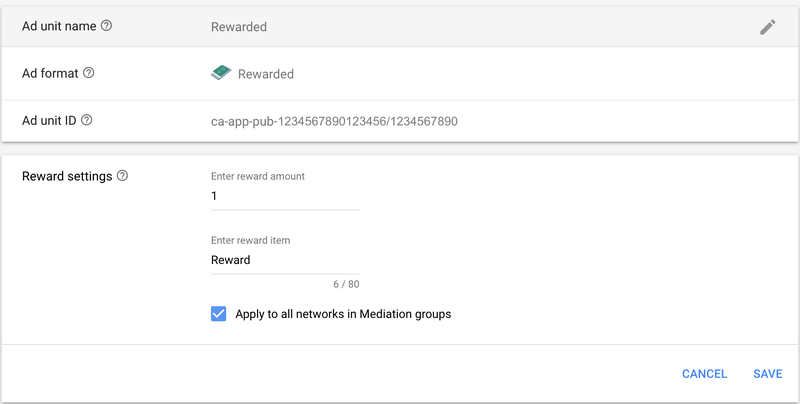 This guide is intended for publishers who want to use the Google Mobile Ads SDK to load and display ads from MoPub via mediation. It covers how to add MoPub to an ad unit's mediation configuration, how to set up Ad Network Optimization (ANO), and how to integrate the MoPub SDK and adapter into an iOS app. First, sign up and log in to your MoPub UI. Navigate to the Apps page and click the Add a New App button. Select iOS as the Platform for your app, enter the App name and iTunes URL of your app. Then select a primary and secondary category of your app from the provided list. MoPub requires you to create your first Ad Unit before finishing adding your app. Note: To add an Ad Unit to an existing app, navigate to the Apps page in the MoPub's UI and select the app for which you want to add the Ad Unit. On your app's details page, click the Add an Ad Unit button. For additional instructions on creating an ad unit, select the tab corresponding to your preferred ad format. Choose Tablet as the Device type. Choose a banner format that matches the ad size you're requesting in your app. Enter a Name for your Ad Unit. 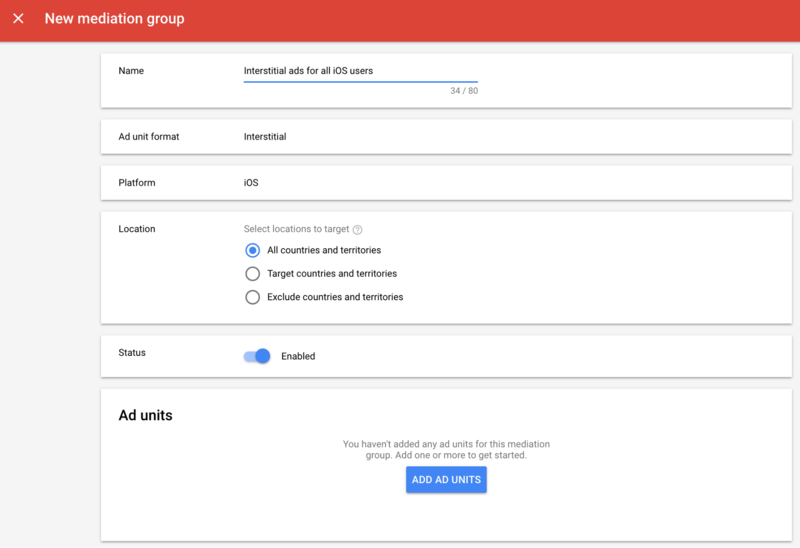 The refresh rate is handled by the Google Mobile Ads SDK according to your refresh rate setting in the AdMob UI. So, we recommend using a high value for the Refresh Interval here (e.g. 1000 seconds). Note: The Banner size chosen here should match the request size in your app. The adapter ignores the size passed during the banner ad request. Choose Tablet as the Device type. Choose Fullscreen Tablet as the Format. Enter a Name for your Ad Unit. Choose the type of Layout to present the ad in. Choose Tablet as the Device type. Choose Native (Custom layout) as the Format. Enter a Name for your Ad Unit. Note: Your app is responsible for placing the ad when integrating native ads with the Google Mobile Ads SDK. The MoPub adapter is not responsible for ad positioning, just passing back the native ad assets. It does not use the AdPlacer code. Therefore, the Ad positions setting is ignored. Click Save and View Code Integration to get your Ad Unit ID. 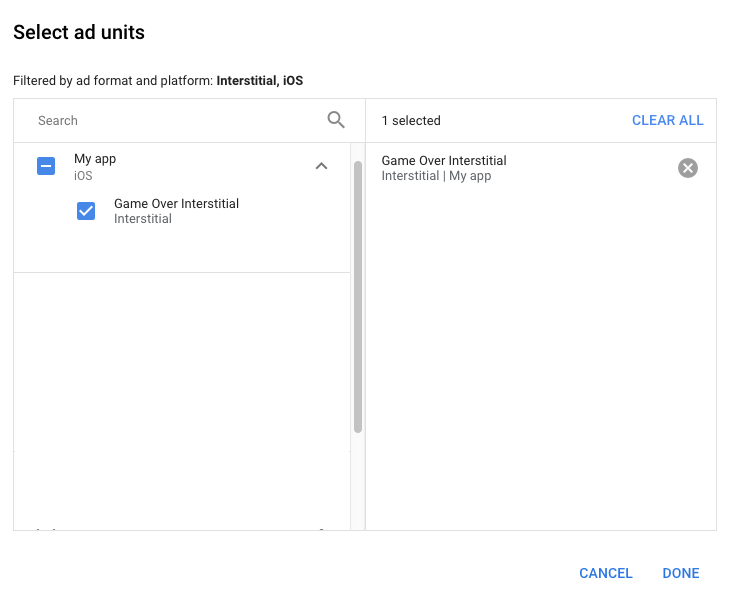 Note: To find your Ad Unit ID for an already existing ad unit, navigate to the Apps page, select your ad unit under the Ad Units section and click the Code Integration button. In addition to the Ad Unit ID, you'll also need to obtain your MoPub API Key and Inventory Report ID to set up your AdMob ad unit ID. To find your API Key and Inventory Report ID, navigate to the Reports page and click View API Access Details. To get ads from MoPub, your account needs to be approved for MoPub Marketplace. During your initial account setup, you will be prompted to go through the process for Marketplace approval. Part of this process includes entering your payment information. See the Marketplace setup guide for more details. 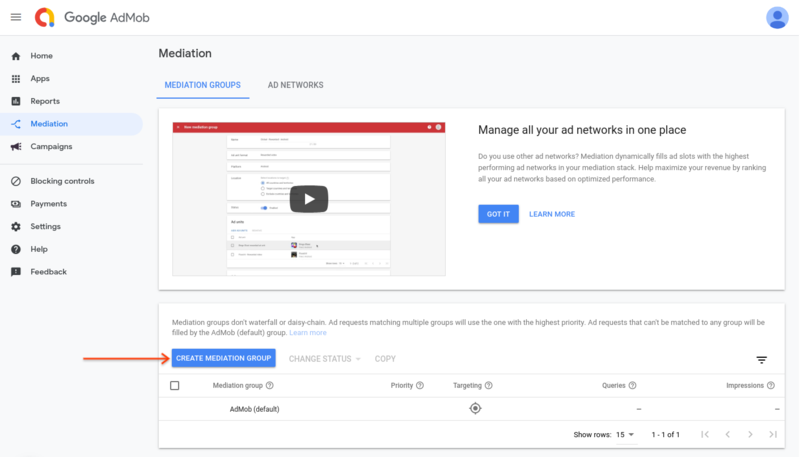 You need to add MoPub to the mediation configuration for your Ad Unit. First sign into your AdMob account. Next, navigate to the Mediation tab. 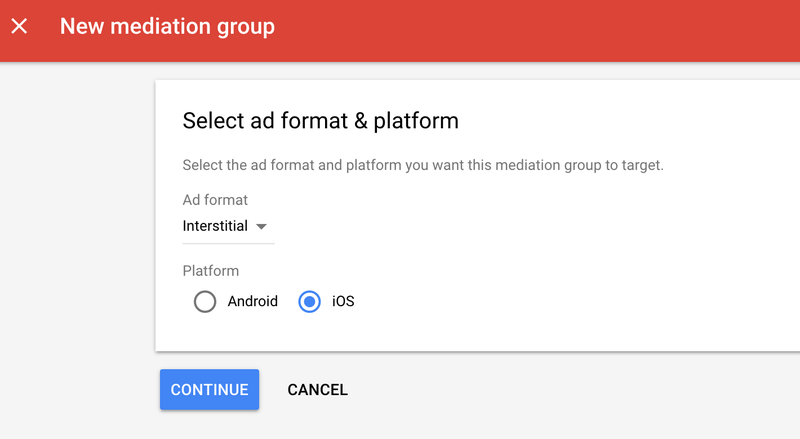 If you have an existing mediation group you'd like to modify, click the name of that mediation group to edit it, and skip ahead to Add MoPub as an ad source. In the Ad Sources card, select Add Ad Network. Then select MoPub. Enable the Optimize switch. Enter the API Key and Inventory Report ID obtained in the previous section to set up ANO for MoPub. Then enter an eCPM value for MoPub and click Continue. Next, enter the Ad Unit ID obtained in the previous section. Then click Done. If you don't apply this setting, the MoPub adapter passes back the reward specified in the MoPub dashboard. Download the latest version of the MoPub SDK and link the MoPubSDK source code in your project. Download the latest version of the MoPub adapter and link MoPubAdapter.framework in your project. 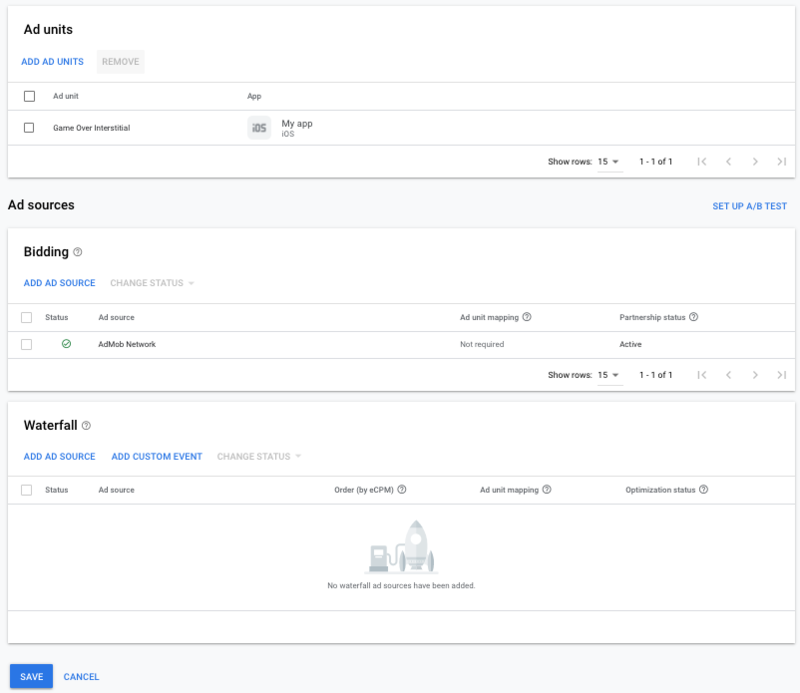 Before loading ads, have your app initialize the MoPub SDK by calling initializeSdkWithConfiguration: with any valid MoPub Ad Unit ID that you created in Step 1. This needs to be done only once, ideally at app launch. To get test ads from MoPub, you need a guaranteed or backfill line item. MoPub recommends adding the Demo line item to your Ad Unit to get test ads. The Demo line item is added to your MoPub account by default. The Demo Line Item contains test creatives for native and banner ad units by default, but does not have a test creative for interstitial ad units. To add your own test creative for interstitial ads, you need to upload a simple image to the MoPub UI by navigating to the Demo Line Item and clicking the Add a New Creative button. Choose Tablet Full Screen format. Fill the form with the necessary details and click Save to add your test creative to the Demo Line Item. That's it! You now have a working mediation integration with MoPub. To collect consent for MoPub, MoPub asks that you use its consent mechanism. See the MoPub GDPR Publisher Integration Guide for more information. privacyIconSize - Set the size for the MoPub privacy icon in points. Values can range from 10 to 30 inclusive. The default size for the privacy icon is 20. MoPub and Google Mobile Ads SDKs track impressions in their own way, so there may be discrepancies. Clicks are detected by the Google Mobile Ads SDK and are forwarded to MoPub SDK, so click reporting will be in sync. For more details on how to set up test ad units, see MoPub's Testing Ads guide.